In every age the Lord wants his mercy to be known to us. Over time you have no doubt noticed the Lord revealing Himself through the works of various saints: Saints Gertrude, Mechtilde, Margaret Mary Alocoque, Claude la Colmbiere, Fautina, and Blessed Francisco de los Hoyos. Most often the call to recognize divine Mercy has come in the devotion to the Sacred Heart of Jesus which we ordinarily devote the month of June to. Today is the fruit of Saint Faustina's mission to make known Jesus' invitation to enter into His heart. Today is dedicated to Divine Mercy, as recommended by Pope John Paul II based on the visions of Saint Faustina. As you might know in Memory and Identity by John Paul spoke of mercy as the limit of sin. Why not give yourself over to the work of divine mercy? Divine Mercy Sunday is a day in which we recognize God's looking with pity on our nothingness. Saint Faustina told us of her certainty based on your vision of the Lord that there is a certain promise from the Lord connected with this festal observance: the complete forgiveness of sins and punishment of the person who receives Holy Communion in a state of grace (that is, the person who has made a good confession). Here God promises to be merciful in giving his divine justice. Jesus is eager to love us. It is a promise of a restoration of one's friendship with God. I highly recommend you spend some time in prayer, if possible, at 3 pm, using the Chaplet of Divine Mercy. These graces of mercy are not limited today alone. You can receive them anytime you want ... if you are open to receiving them. This second Sunday following Easter is the day on which the newly baptized officially put away their white robes, it is therefore known liturgically as "Dominica in albis depositis" or the "Sunday of putting away the albs." Today we also hear John 20: 19-31 proclaimed which focuses our attention on the doubts of Saint Thomas at hearing the news of the risen Christ. 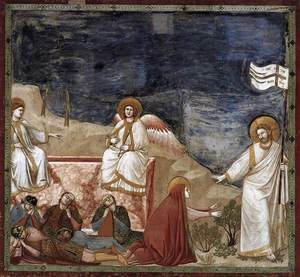 In his book, The Liturgical Year, Dom Prosper Gueranger writes, "Our risen Jesus gave an additional proof that he wished the Sunday to be, henceforth, the privileged day. He reserved the second visit he intended to pay to all his disciples for this the eighth day since his Resurrection. During the previous days, he has left Thomas a prey to doubt; but to-day he shows himself to this Apostle, as well as to the others, and obliges him, by irresistible evidence, to lay aside his incredulity. Thus does our Saviour again honour the Sunday. The Holy Ghost will come down from heaven upon this same day of the week, making it the commencement of the Christian Church: Pentecost will complete the glory of this favoured day." who proclaimed the glad tidings: Alleluia! recently come to the waters, and full of God's light and splendor. Alleluia! Alleluia! Oh, how lovely and how wondrous, Is the cure that saved us all: Jesus, in His love, becomes now, Victim for His people's fall! 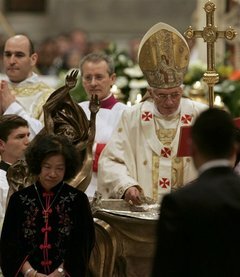 Now renewed through holy washing, In the font of our rebirth, Soon the chrism's oil and fragrance, Will give strength to us on earth! To each Christian now is given, Christ's own Flesh as Bread of Life. Christ's own Blood becomes the sweetest, Source of joy in all our strife! Easter week brings so many joys, graces and consolations. One such joy, grace and consolation that I've been thinking and praying about all week during Mass and praying the Divine Office, is the is new life in Christ that those received into the Church at the Easter Vigil and on Easter Sunday. The gift of salvation given to us is has once again been given to other called not by human concern but by the Holy Spirit. The Neophytes --the newly-initiated Christians who were baptized and confirmed and communicated-- live differently now that the doors of our God-given destiny has been received. Musically we can think of the chant text given above, "Isti sunt Agni novelli," taken from the Cistercian collection Laudes Vespertine (Westmalle, Belgium, 1939) which gives a keen insight into this beautiful mystery of faith. May Christ shower His blessing on all of us! After your descent into Hades, O Christ, and your Resurrection from the dead, the disciples grieved over your departure. They returned to their occupations and attended to their nets and their boats; but their fishing was in vain. You appeared to them since you are the Lord of all; you commanded them to cast their nets on the right side. Immediately your word became deed. They caught a great number of fish, and they found an unexpected meal prepared for them on the shore; which they immediately ate. Now, make us worthy to enjoy this meal with them in a spiritual manner, O Lord and Lover of us all! Looking at Luke 24:38ff Christ says, "Why are you troubled, and doubts arise in your heart? Look at my hands and my feet, touch and see." Commenting on appearance of Christ in His glorified body, Saint Augustine of Hippo in Sermon 246 tells us that Christ wanted to offer evidence of His resurrection from the dead as a reality! 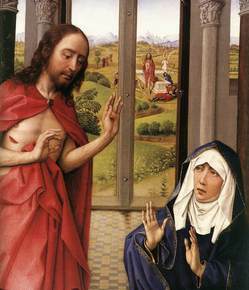 "Was He perhaps already ascended to the Father when He said: 'Touch me and see'? 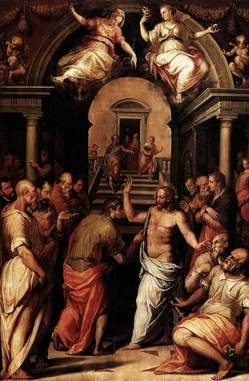 He let His disciples touch Him, indeed, not only touch but feel, to provide a foundation for faith in the reality of His flesh, in reality of His body [ut fides fiat verae carnis veri corporis]. The well-foundedness of the reality had to be made obvious also through human touch [ut exhibibeatur etiam tactibus humanis solidatus veritatis]. Thus He let Himself be touched by the disciples." 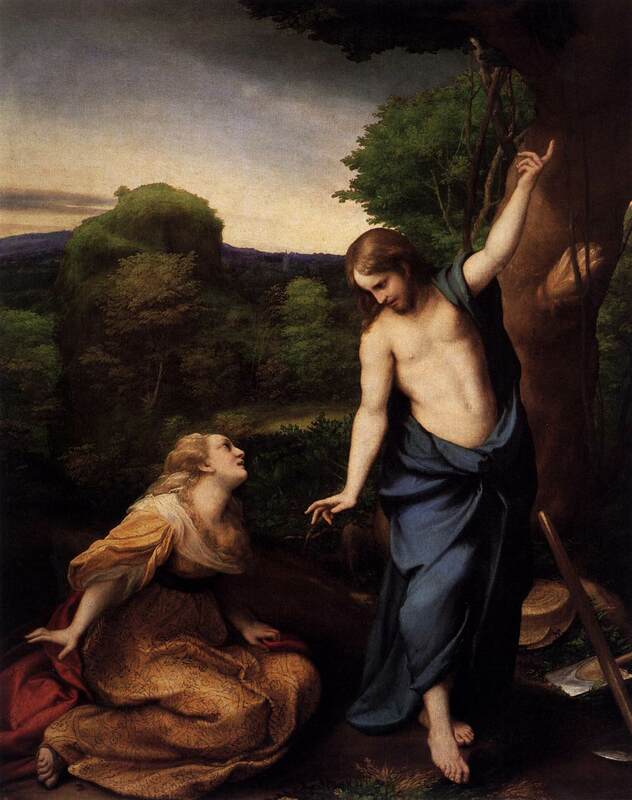 Later on Augustine asks about the women who were asked by the Lord not to touch Him because He had yet made the ascension, "What is this inconsistency? The men could not tocuh Him if not here on earth, while the women would be able to touch Him once He ascended to heaven? But what does touching mean if not believing? By faith we touch Christ. And it is better not to touch Him with faith than feel with the hand and not touch Him with faith." 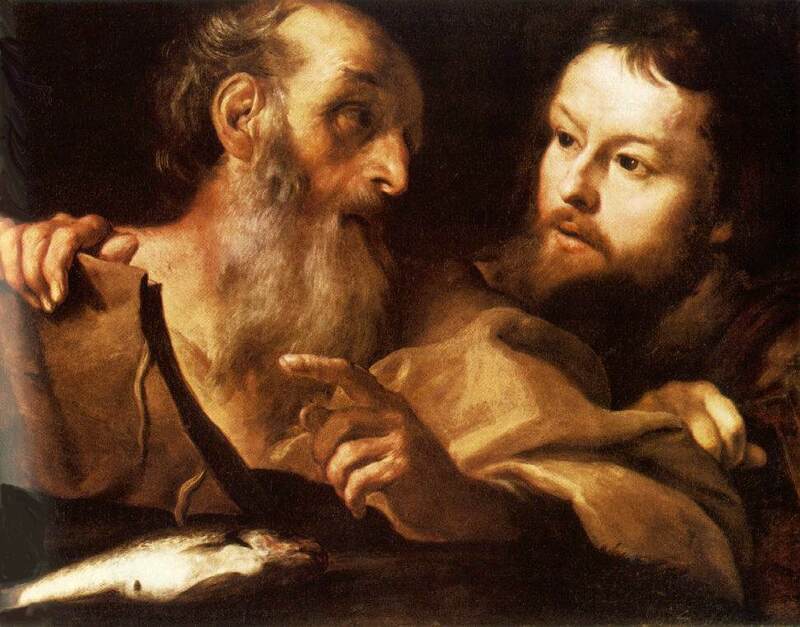 Augustine points us to the proof Christ offers: faith. "The scar of the wound on His flesh served to heal the wound of disbelief." The Lord wanted to cure those who disbelieved. Love is stronger the life! This page is a archive of entries in the Easter, Ascension & Pentecost category from April 2010. Easter, Ascension & Pentecost: May 2009 is the previous archive. Easter, Ascension & Pentecost: May 2010 is the next archive.